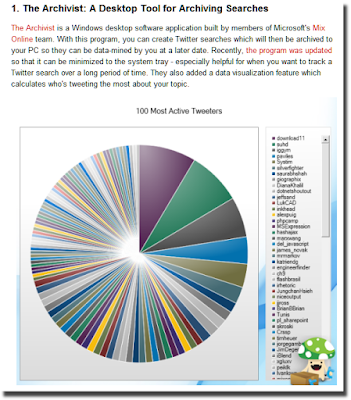 As junk visualizations go, while there has been enough that has been written on the drawbacks with the pie chart, this example below, from 10 Ways to Archive Your Tweets, brings out the problem in a most, shall we say, visual manner. As far as gleaning any information from this chart goes, it's a lost cause. You would need to possess incredibly powers of being able to precisely position your mouse over a particular slice to see its value. If, on the other hand, you decided to go down the legend, see a name, and then go to the pie chart to figure out the value of the slice, there are so many colors in use that the entire exercise would be reduced to an almost futile case of trial and error. So what in its place? A simple table would have sufficed. With perhaps an underlying data bar on the cells. You could conditionally format the table so as to color code the rows in deciles, or quartiles. Or you could slice the data by deciles, and place a dropdown above the table so that only ten rows at a time were displayed. Or you could display only the top 10 and the bottom 10 tweeters by default, and provide the user with an option to expand the middle 80 rows of the table. Or almost anything else. But this pie chart.